Achieving environmental literacy though biophilic design, eco-restoration, and management of play and learning opportunities for children and youth in urban green infrastructure. Children and youth (0-17) in the USA number 74 million (the highest ever) but account for only a quarter of the U.S. population (the lowest ever). Approximately 85% live in urban areas. Metro areas accommodate a highly variable proportion of total population (18% – San Francisco, lowest; 55% – Laredo, highest). How can urban design expose and restore urban nature so children and youth engage with compelling, equitable places for creative play and learning? How can nonformal education in nature enrich playful learning in the arts and sciences in the city. If learning no longer happens solely in school classrooms, can urban design and programming become an educational resource? How can cities be designed and managed to offer natural learning environments close at hand, to inspire young people to acquire a nature ethic? 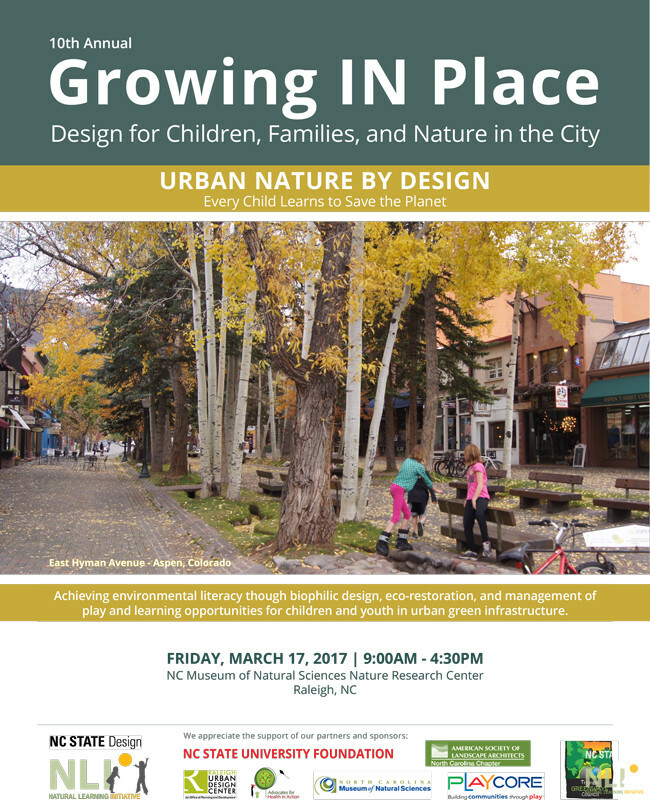 Growing IN Place 2017 addresses these questions by considering urban planning and design policies that support contact and learning from nature of urban children and youth. Green networks of attractive, walkable/bikable pathways are needed, connecting homes to places where natural learning happens: schools, parks, community gardens, and cultural institutions — places designed to help young people identify with urban ecosystems. Growing IN Place 2017 is framed for public/private sector practitioners, landscape architects, architects, planners, parks and recreation professionals, teachers and environmental educators, citizen activists, and elected officials. Professions that need to work together to create urban environments that support children’s natural curiosity and learning. Caren B. Cooper, PhD, Research Associate Professor, Forestry and Environmental Resources, Chancellor’s Faculty Excellence in Leadership in Public Science. Jointly appointed Assistant Head, Biodiversity Research Lab, NC Museum of Natural Sciences, Raleigh, NC. Integrating social and natural ecologies in cities. Christine (Chris) Goforth, MS, Head of Citizen Science, NC Museum of Natural Sciences, Raleigh, NC. Engaging kids and families in urban eco-learning. Viniece Jennings, PhD, Biological Scientist, Southern Research Station, U.S. Forest Service, Athens, GA. Urban Nature at the Intersections of Public Health and the Sustainable City. Andrew Moore, MGA, Director, Youth and Young Adult Connections, National League of Cities, Washington, DC. 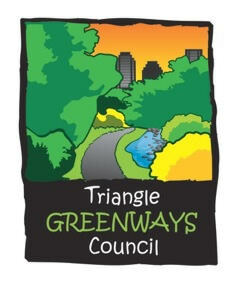 Engaging youth in creating eco-literate cities. Robin Moore, Dipl.Arch, MCP, Hon ASLA, Director, Natural Learning Initiative; Professor of Landscape Architecture, College of Design, NC State University, NC. Designing the eco-literate city. Laura Solano, RLA, Principal, Michael Van Valkenburgh and Associates (MVVA), landscape architects, Cambridge, MA. Restoring green infrastructure: Readable, interactive ecoengineering in the public realm. Kathryn Stevenson, PhD, Assistant Professor, Department of Parks, Recreation, and Tourism Management, College of Natural Resources, NC State University, Raleigh, NC. How kids learn about nature in the city. Juan Torres, PhD, CIP, Associate Professor, School of Urbanism and Landscape Architecture, University of Montreal, Montreal, Canada. Evidence-informed planning policies for urban childhood.